Your typical NYC co-op will require three to six personal and professional reference letters per applicant. It’s important to ask for these reference letters as soon as you have a fully executed purchase contract. As a precaution, you should seek more reference letters than required as some of your references will undoubtedly be late or may even write less than flattering content about you. Keep in mind that even if you are buying a condo in NYC, reference letters may still be required. We’ve included sample NYC co-op professional, personal, employer and landlord reference letters in this article as well as some additional information, tips and tricks about preparing the reference letters for your NYC co-op purchase application. How many reference letters does a typical NYC co-op board application require? Are reference letters required for both condos and co-ops in NYC or just coops? How long should it take to assemble my board application reference letters? 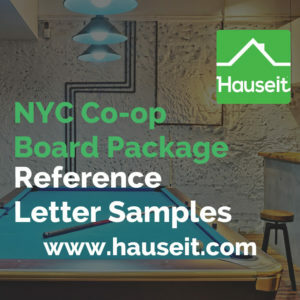 What is the suggested length of a NYC coop reference letter? What should be included in a personal co-op reference letter? What should be included in a professional co-op reference letter? What if my landlord is a friend or family member? What is an employer reference letter? How do I provide an employer reference letter I’m self-employed? What if I don’t have enough people to ask for reference letters? Do co-op reference letters need to have original signatures, or are copies okay? What are some general tips for preparing NYC co-op reference letters? A typical co-op building in NYC will request between three to six business/personal reference letters per applicant in addition to both a landlord and employer reference letter. Like every other item in the board application, the specific requirements vary depending on the co-op building in question. While some board applications will set clear guidelines for the reference letters (i.e. no family members), other board applications are more flexible in terms of what they are looking for. When in doubt, you should always ask your buyer’s agent to clarify any specific reference letter requirements directly with the listing agent and/or managing agent. Employment verification letter from current employer, stating position, hire date, and income. One employment reference (indicate salary, length of employment, position and bonuses). If not employed within the last six months please provide a letter from your previous employer. One current landlord reference indicating the timeliness of rent payments. Pro Tip: As you can see, requirements can vary dramatically by building. Often times, you’ll see smaller walk-up buildings or self-managed coops have very relaxed requirements when it comes to the purchase application and reference letters. And if you’re lucky enough to be buying a sponsor unit, then you can skip the board approval process altogether. Keep in mind that even though you may not have to submit the full purchase application nor will you have to attend a coop board interview, you may still be asked to complete some sort of abbreviated application for a sponsor sale. Although the perception is that only co-ops have board applications in NYC, many condo buildings also require buyers to complete a purchase application. The typical condo board application is less rigorous than what is requested by a comparable co-op building. However, it is possible that your condo building may also require the submission of references and/or reference letters. If you happen to be buying a co-op apartment directly from a sponsor, it is unlikely that you will be required to submit reference letters. You should be aware of the fact that buying a sponsor unit does not necessarily guarantee that you won’t have to complete some sort of board application. Although a co-op will not reject your application for a sponsor unit, they may require the submission of an abbreviated board application for the purposes of verifying your assets and running credit and criminal background checks. If you happen to be buying your neighbor’s apartment, your coop building will still likely require the submission of an abbreviated board application. Pro Tip: It’s a worrying trend for more condos to ask for reference letters and condo board packages that sometimes rival co-op board packages in length. Just remember that by doing so, condo boards are shooting themselves in the foot by presenting themselves as unreasonable people who think they live in a co-op and are mad for power. The best way to avoid condo buildings like this is to ask to see the condo’s purchase application, if any, as early as possible in the process. In fact, it’s possible to ask the listing agent for a copy of the sales application before even making an offer, even though traditionally the buyer gets a copy of the purchase application only after an offer has been accepted. The amount of time you have to request and assemble your reference letters will depend on whether you are financing your purchase. If you are financing the purchase, you have slightly more time because you need to wait for your mortgage commitment letter before submitting your application. Receiving a commitment letter from your bank typically takes 3 to 5 weeks. 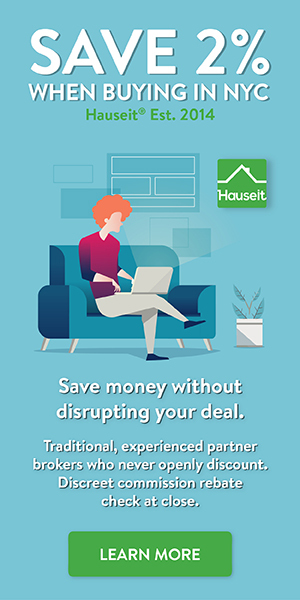 If you are making an all cash purchase, you will be able to submit your overall board application in a much more timely manner since you do not need to wait for a mortgage commitment letter. Whether you are financing or making an all cash purchase, it’s suggested that you request your reference letters as soon as you have a fully executed contract and have received the co-op’s financial requirements. It’s also a good idea to request more than the minimum number of reference letters to avoid the risk of delays or having to be reliant on a less than stellar reference letter from one individual. You should also keep in mind that your purchase contract may also require that the board application be submitted within a certain number of days after you receive a mortgage commitment letter. There is no specific requirement for the length of a co-op reference letter. The suggested length of a board package reference letter is anywhere between three paragraphs to a page and a half. While a reference letter shorter than three paragraphs may draw additional scrutiny, a reference letter which is too long may lose its effectiveness. Above all, reference letters should be insightful and concise. Quality as opposed to quantity is the most important consideration when considering the length of a reference letter. The ultimate purpose of the co-op reference letters you submit is to help the board obtain a qualitative sense for how you are as a person and how you would interact with and contribute to the co-op community. Go into detail on the nature of your interactions with the candidate. What sorts of activities and events have you both attended as common interests? Examples may include theater, sports, charities, a previous workplace, professional associations, travel buddies, etc. Were you or they ever a guest in your respective homes? Specify the defining character traits of the candidate, offering examples of why words such as “responsible, trustworthy, honest, ethical, etc.” are fitting descriptions. Make reference to the candidate’s educational background as well as academic and other achievements, if you are privy to these aspect of the candidate’s life. If you have experience living in a co-op and/or being involved in the board, share this information in order to enhance your credibility with the audience. Identify the personal attributes of the candidate which would make him/her a good neighbor in the co-op. A typical NYC co-op purchase application will request anywhere from 1-4 professional business reference letters per applicant. Describe how and why you know the candidate professionally. Provide insight into how and why you met them, for how long you’ve known each other, and the nature of your professional association. Share the characteristics of the candidate which make them excel at work. For example, are they leaders, team players, visionaries and/or do they have a positive attitude in the workplace? Offer insight into what achievements the candidate has accomplished at work. If you have experience living in a co-op (in NYC or elsewhere), identify the personal attributes of the candidate which would make him/her a good neighbor in the co-op. The purpose of a landlord reference letter is to ensure that you have previously paid your rent obligations in a timely manner. A typical landlord reference letter should include the address of the unit you are renting, the length of time you’ve lived there and the amount of your rent. It should also share whether you’ve been timely with your rent payments. If your co-op purchase application does not specify what should be included in the landlord reference letter, we suggest that you include as much detail as possible including all of the items mentioned above. The fact that your landlord is a friend or family member should not pose an issue to your co-op board package. In the event you are renting from a friend or family member, you should request a letter from them which includes the typical content of a landlord reference letter: address of the property you are renting, the length of time you’ve lived there, how much rent you pay, and whether you pay rent in a timely. If you are living rent-free with a friend or family member, you should request a letter from him/her which states where you live, how long you’ve lived there and explains that you are not paying any rent. This would be similar to getting a signed gift letter for a mortgage if you were getting help from a family member for your down payment. An employer reference letter is different from the ‘professional’ reference letters we discussed previously. The purpose of an employer reference letter is to verify factual data such as where you work, the dates of your employment, the amount and nature of your compensation, as well as the specifics of your current role/position. Because they simply offer non-qualitative data about your relationship with the company, an employer reference letter is typically provided by the Human Resources (HR) department. As such, the easiest way to request an employer reference letter is to request one from your HR contact. If you work for a small firm which does not have a standalone HR department, then you should request the employer reference letter from whoever is able to verify the nature of your employment. Note: Your mortgage banker or broker will also have to verify your employment with an actual phone call typically two days before closing. Someone from your bank lender will call the number you provided for your employer to confirm verbally that you are indeed still employed. This can be a problem if you’ve been fired or laid off before closing. Depending on how well your lawyer has protected you in your purchase contract, you may still be able to get your contract deposit back. If you are self-employed, you should request your professional reference letters from whoever you work with in a professional context. It’s also important to note that if you do not have a traditional employer, a typical NYC co-op board package will also ask you for some additional financial verification items above and beyond the standard REBNY financial statement, bank statements and bank verification letters. These additional items may include a notarized letter from your accountant, profit/loss (income) statements from your business, and/or the operating agreements/formation documents from whatever legal entities you are conducting business. As a co-op candidate in NYC, it’s very important that you follow the board application instructions and submit a comprehensive board package the first time around. Submitting less than the required number of references will only result in the managing agent rejecting your application and sending it back to your buyer’s agent for correction before the board even has a chance to review it. If you feel that you don’t have enough people to ask for references, you may want to have your buyer’s agent verify the specific reference letter requirements with the building’s managing agent. There’s always a chance that reference letters from family members are permitted, and/or the board only needs one set of reference letters for you and your significant other (as opposed to a set for each of you). Whether you need to submit original (ink signature) reference letters depends on the specific requirements of your building’s purchase application. If the board package instructions refer to ‘original’ reference letters, then your references will need to mail you the original, signed letters. If the application does not specify, it’s a good idea to have your buyer’s agent verify the specific requirements with the managing agent before submitting the board package. If you requested a NYC buyer agent commission rebate and are working with a seasoned buyer’s agent, he/she will take the initiative to collect and assemble any original documentation required from you and the seller. If you are selling FSBO in NYC and your buyer is unrepresented, you will need to take a leading role in reviewing your buyer’s board application and coordinating the receipt of all original documents. The purpose of reference letters is to shed light on your positive qualities and strengthen the allure of your overall candidacy for the co-op. However, poorly drafted reference letters can also significantly weaken your application. Always include the reference contact details on the letter: email, phone and address. Make sure that each reference letter is correctly formatted in a similar manner to the example reference letters we’ve included below. Watch out for fake/plagiarized letters. If you send your references a template or sample letter, please ensure that they do not copy anything word for word. Submitting similar reference letters is an immediate red flag for the board, and it’s something they will be on the lookout for. Ensure that grammar and spelling are perfect. Read the reference letters to check for accuracy and consistency, as you may be questioned on them during your board interview. We are delighted to offer our full support of Nigel and Alexis’s co-op application to your cooperative board. It is hard to believe that I’ve known Alexis for nearly twenty years and her husband Nigel for nearly ten years. Alexis and I met at a sleepaway summer camp in the late 1990s, and even though she grew up in Arizona and I in Maine, we took efforts to stay connected all these years – exchanging hand-written letters back in those days and typing long emails before text messages and Facebook. I felt extremely lucky when we all ended up in NYC, now nearly a decade ago, and that we have since been able to spend time together much more regularly. Alexis and Nigel, shortly before they were married, moved to the same UWS building as me and my husband nearly ten years ago. We were their upstairs neighbors for two years and enjoyed being able to pop over for meals that they hosted, or invite them over for a drink or a chat, anytime. They were incredibly supportive anytime we needed them, and also a tremendous help when we were in the process of purchasing our first co-op. Having gone through the co-op ownership process ourselves, we feel that this is a wonderful next step and fit for Nigel and Alexis, who will be a phenomenal addition to any community they join. We know first hand that it’s wonderful to have Alexis and Nigel as friends and neighbors. The warmth and consideration that they have for others would be a tremendous asset to your building – we only wish they could be moving to ours! I would be happy to answer any questions about their candidacy. Please do note hesitate to reach out with any questions. My husband and I have been dear friends of Abigal and Mitchell for about seven years now. How we met, I believe epitomizes what warm and thoughtful people they are to the core. Abigal previously was Director of Hospitality for a successful restaurant group, and we got to know her initially as regular guests of their first restaurant that was around the corner from our former apartment. Abigail was overflowing with generosity, care, and brightness, a magnetism that instantly captivates you. As we started to get to know one another, she told us how we must meet Mitchell, who she was about to marry at that time. Ironically, my husband and I similarly were just married three weeks before Abigal and Mitchell, the first of many incredible commonalities and shared experiences. All it took was one double date, and we were friends for life – true serendipity we think. I too work in the restaurant industry, so in addition to being close personally, I have had over the years quite a bit of overlap in network and community with Abigal and Mitchell professionally. They are two of the people we turn to most for career guidance and advice, as they hold the highest sense of ethics and reputation. Abigal and Mitchell welcome those they care about with open and earnest arms, both the true embodiment of hospitality in every sense of the word. If you have the good fortune to be invited over to their home for a meal, it might just ruin every other dining out experience, as it is just unparalleled. Further, should you be lucky enough to be part of their circle, their loyalty, integrity, and enthusiasm for life is one of the most enriching influences anyone could ever ask for. They are the definition of good citizens, with a passion for wellness, animals, and pure spirituality, helping others be the best they can be from the inside out and supporting others to make the most out of life. Each is immensely charitable, responsible, and forthright in every facet of their personal and professional lives. It is with the utmost honor and respect that I recommend Jeff and Nicole with the highest regard as hopefully future tenants of your apartment. I am confident it would be a decision well made. Please feel free to reach me should you want additional information. I write in support of the co-op application of Pollyana. I have known Polly for over 10 years. We became friends after meeting through mutual friends in the Williamsburg neighborhood of Brooklyn. We share a common interest in writing, reading and music – and we both worked in the publishing industry. Even after I moved a few neighborhood subway stops away, we’ve remained close friends. As a result of knowing Polly for a decade, I can assure you that she is a person of remarkable maturity and reliability. She is one of the most personally dependable and financially responsible people that I know. My husband and I have come to depend on Polly in countless ways. For example, Polly has cat sat for us on multiple occasions. She is also one of the few people to whom my husband and I would entrust to take care of our 4-year old son. Obviously, I have a great deal of faith in Polly and trust her without reservation. I’m sorry that Polly is moving a bit further away, but we’ve already discussed what great food options in Jackson Heights so I’m at least thrilled that I’ll have the opportunity to visit her in her new home, should you consider making her a part of your community. I recommend Polly without reservation. Please feel free to contact me at [redacted] with any further questions. It is my distinct pleasure to recommend Richard Jones along with his wife Naomi and their sons, Blake and Samuel, to you as shareholders and as residents in your building. I have worked with Richard for nearly seven years, since we opened the New York office of our firm in 2010. Richard is among the most outstanding, diligent, and hardworking members of our firm, and it is these traits that prompted the Board of Directors to invite him to join the firm as a founding member in 2005. For the same reasons, not long after we opened the New York branch, we invited Richard to move to NYC. Since then, he has become a key contributor to our business. My wife, Eleanor, and I have both enjoyed getting to know Richard and Naomi socially as well. We have found Naomi to be an intelligent, mindful, and energetic friend and a great mother to her kids. We are delighted that Richard and Naomi have chosen to put down roots in NYC, as evidenced by their enrolling their children in schools here and applying to become shareholders in your co-op. We have lived on the Upper East Side for 32 years. Both of us have served on the Boards of our Co-ops, and l was previously President and Treasurer of our current building. With this background, we believe we understand the qualities that an ideal resident family possesses: conscientiousness, financial responsibility, and neighborliness. We cannot imagine a family that better represents these qualities than the applicants who stand before you. I hired Chad Fenner in 2011 to join the team of my newly opened restaurant, [redacted]. He quickly rose through the ranks and in 2013 he took over as general manager. Four years later after many successful years operating [redacted] to incredibly exacting standards he is now also my partner in our newest venture, [redacted]. Chad is loyal, sharp and a hard working gentleman – and the success of ventures he operates for me stands for itself. Beyond its financials, the quality of its offering has evolved by leaps and bounds. [Redacted] has been awarded a great many awards under Chad’s leadership. A bit about Chad and his wife, Mary. They met while working together at [redacted]. She is a magnetic person – intelligent, charming, caring and hardworking. I have all the confidence that Chad and Mary will be successful, not only professionally but also in their personal life. The intensity and wisdom that permeate all of the decisions made by Chad and Mary are beyond unique in every walk of the business world I inhabit, and I have supreme trust in all of their judgements individually and as a team. I am writing to recommend Nigel in his application to your cooperative board. I believe he will make a wonderful addition in your community and I fully recommend him to you. I first hired Nigel in September 2013, after hearing great reviews from the supervisor of a role he was consulting in at [redacted]. I then was his manager until January 2017, when I moved onto a new role. We continue to work together under the broader news group. Over the course of our professional time together, I have continually been impressed by Erol’s professionalism, reliability and easy-going nature. I can always trust that he will do his work with integrity as well as soul, and that he will be open and forthcoming with any issues or concerns in a kind and gentle manner, as well as possible solutions. He is a true team player and someone who is genuinely interested in the well-being of others, qualities that make for an excellent staff member as well as neighbor. Please consider him for membership in your coop. You will not be disappointed. For any questions, feel free to reach out to me, anytime. Pro Tip: Please use these sample NYC coop board package reference letters as guides on what your actual reference letter might look like. Please resist the temptation to copy these reference letters word for word, or even nearly word for word. We’ve seen too many prospective buyers get rejected because their references didn’t want to waste time on writing a letter and instead just copied samples they found online. Remember, it doesn’t take much for a co-op board member to Google a phrase in your letter and see that an entire reference letter has been plagiarized! This is to state that Mr. Richard Felix has been a tenant of ours in Apt. 3E at the above address for the last two years, he has been a tenant of good standing and has always paid his rent (currently $5,750) on time. I am writing to you in support of Lisa and Chris White’s co-op application to your cooperative board. I do so with pleasure. I have known Chris for nearly 5 years, having met while we were both working at [redacted]. As we both lived on the west side of Manhattan, we both enjoyed taking the company’s shuttle to its headquarters outside of NYC. Over the course of our years of commuting together, I got to know Chris better, as he is the kind of person who is always open to smile and chat. I have always been impressed with his courteousness, professionalism and calm demeanor, and his ease in getting along with a variety of people. Fortuitously, in Fall 2013, Chris and his wife, Lisa, were looking to move to a new apartment right when I was looking for a tenant for my own place. Because of his outstanding professionalism, trustworthiness and friendly manner, I knew he and Lisa would make wonderful tenants, and I offered them the option of moving to my place. Chris and Lisa have been excellent tenants, always paying their monthly rent of $3750 in a timely manner. Please do not hesitate to contact me with any further questions. Pro Tip: If you are worried about your references wasting their valuable time by having to write original letters, don’t be. Everyone will waste more time if you instruct them to use template letters you’ve found online. That’s because after your purchase application is rejected for plagiarism, you’ll have to ask them all over again to write new reference letters! Re: Employment Verification for Chris W.
This letter is to confirm that Chris W. is currently employed by [redacted]. He has been employed since July 2nd, 2014 and is currently in good standing. His job title is: Senior Director, Digital Media. His current annual salary is: $175,000. Should you require any further information, please do not hesitate to contact me at [redacted]. Jason D. has been employed at [redacted] since 2005. Jason has occupied the position of General Manager for over 6 years, and his employment is expected to continue for the foreseeable future. If you have any further questions I am happy to address them and may be reached at [redacted]. Pro Tip: It’s critically important to not use these templates for your actual NYC co-op board package reference letters. If you do, there’s a distinct possibility that your act of plagiarism will be detected by the co-op board and your application will be rejected. After all, if your first interaction with the co-op board is one of laziness and plagiarism, how can the co-op board expect you to behave once you’re a shareholder?